Shankar is an Indian singer and music composer. He is an engineering graduate trained in Carnatic and Hindustani classical music. He's a popular singer in Kollywood industry in South India. 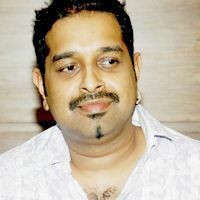 Check out the most updated and latest information about Shankar Mahadevan's on the Internet.We have 172 videos of Shankar Mahadevan including interviews, events, or public appearances.Shankar Mahadevan has over 21 Fans registered on India-Forums.com. We have 209 Bollywood News articles related to Shankar Mahadevan.Do share your criticism, comments and feedback for the Actor on Shankar Mahadevan's comments page. We have over 18 Photos of Shankar Mahadevan to view and download including Shankar Mahadevan's Wallpapers. Love him. He is a great host with a big heart!